Paul Virostek of Creative Field Recording, focuses more on approach and technique than equipment, which I think is entirely appropriate. It’s all too easy to get caught in the vortex of gear over doing creative and innovative things with it. However, it’s always interesting to know what people do use, and why, and what informed their decisions in doing so. 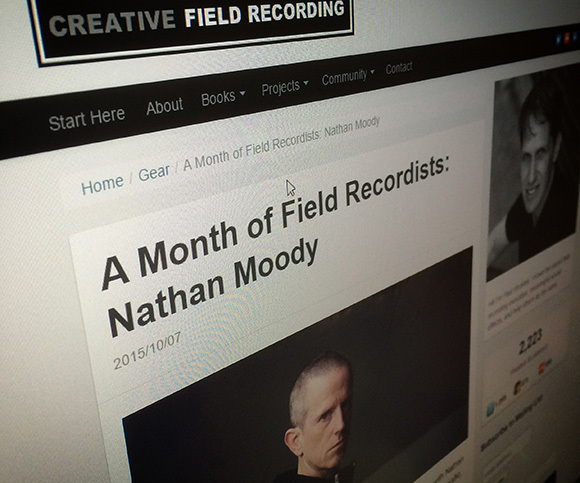 To that end, Paul is in the midst of “A Month of Field Recording,” and yours truly was the latest to be profiled, among such field recordist luminaries as Frank Bry, Watson Wu, and many others. I’m deeply humbled to have been asked to contribute to this series, and thank Paul for the opportunity. What’s more, I also need to thank the online recordist and sound design community, without whom I’d basically know nothing. More than half of those being profiled by Paul this month are people who have exhibited nothing but excitement and patience in fielding my questions to them about gear, practice, and theory.